Who you callin’ chicken, punk? When deciding to write this blog I contemplated which direction to take it. Should I research the absolute specific details, or write from experience? I decided to primarily write from my experience with some sprinkles of specifics. – Which is really how it all started for me. Absolutely NO experience and some well researched specifics that my daughter had documented for her Senior Project. My younger daughter (let’s call her Samantha to protect the innocent), never really asked for much as a child. – It was like pulling teeth at Christmas when you questioned what she might like, so it was heartbreaking for me when at 16 she said “All I want for Christmas is chickens.” Chickens!? What the heck were we going to do with chickens!? Where would they live? Who would take care of them? Let’s face it. The dog that the children swore they would take care of if only we got one became my responsibility VERY quickly. (Which my son recently told me was because we didn’t get a “real” dog. I had to laugh! Since when does a shih-tzu not qualify as a real dog!?) I digress… Chickens were the last thing I needed. Unfortunately, the adorable, fuzzy replica that I gave Samantha for Christmas hurt my heart and did nothing to lessen her desire for chickens. Senior year arrived for her and every student was required to complete a Senior Project. Basically, she had to choose something that interested her, research it, create a plan, follow it through and then write about it. She begged to do it on raising chickens. With the agreement that she have someone ready and willing to accept the chickens at the end of the project, her wish to get chicks was granted. Considering I didn’t think that we would have chickens more than a few months, I was determined not to spend a lot of money. Samantha researched coops and how big they needed to be as well as specifics for how they should be designed. She also researched breeds of chickens and which would be best for egg production and the basics of raising them. – And so the adventure began. The chicks were ordered from Blue Seal and plans for the coop were sketched out. She and my husband built the coop almost entirely out of materials we already had. They repurposed benches and doors from my greenhouse and left-over scrap wood and roofing materials. As for the coop, we really only needed to buy chicken wire and hardware. I would say that if you are unsure about raising chickens, this is a good way to start. 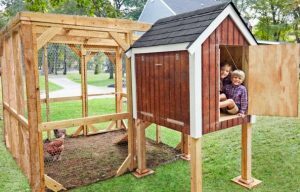 You can find pre-made coops that look beautiful but that you may find aren’t as functional as you would want once you are in the midst of raising your chickens. Are they designed for easy cleaning? Is there good ventilation? Can you access the eggs easily? Are they predator proof? Is there an easy way to attach a run? You don’t want to invest a lot of money and then realize you have to dismantle/modify it to make it work for you! Especially when a quick google search will lead you to a multitude of DIY coops from chicken enthusiasts! Your chicks will typically become your responsibility when they are a day old. These tiny, fuzzy little peeps will need somewhere warm to live and since “chick season” usually starts in early spring, the outdoor coop isn’t ideal. You will want a brooder. We again recycled. Our garage became home to an old small pond/trough that we poured a few inches of shavings in, (with a feeder, a waterer and heat lamps) We had this ready, warm and waiting when the chicks arrived. What can I say? That was when I was hooked. There was something so soothing about the sound of tiny peeps greeting me every time I was in the garage. I found reasons to be in the garage just for the contentment of sitting there with them! You will need a brooder – somewhere warm and dry for the chicks when they arrive. If possible, try to plan for it to be 2.5 square feet per chick because although they start as a tiny palm full of fluff, they will be living here for 6-8 weeks and they grow fast. The temp should start out about 90*-100*F in the warmest spot. You want there to be plenty of room for them to move around because you want them to be able to regulate their temperature and move away from that spot if they get too warm. Every week they will require about 5 degrees less in heat. You will have to clean this area frequently to keep it dry and from smelling. A bag of pine shavings is a good choice for inside the brooder. It’s inexpensive, easy to clean and can be tossed into the compost pile. Your chicks will need a constant supply of clean water and food (placed in the spot furthest from the heat). As for food, they will only need chick starter or crumbles (either medicated or non-medicated – your choice) After a few weeks you will want to add a perch (sticks work great) to encourage them to start to roost. You can also bring them outside for short periods of time (weather and temperature permitting) and you can start giving them “treats” in moderation. Looking online you will discover a long list of do’s and don’ts when it comes to treats for your chickens. I can tell you that my chickens like just about everything I grow in my garden (which can be a problem sometimes!). As your chicks transition from their brooder to a coop you will want to be sure that you plan for 3-4 square feet per chicken (or slightly less if they are going to spend a good amount of time outside). You want space for them to move around, to perch, nesting boxes to lay their eggs in and a place for food and water. Learn from our rookie mistake and don’t make your nesting boxes open at the top or your chickens will perch on the top of the nesting boxes to sleep at night – pooping into the box below (or worse, on to the chicken who might be cuddled inside to sleep!). Over the years we have learned from many of our mistakes. Sometimes, it was just a lightbulb moment, but other times we found ourselves googling things like “poop bum” and “egg bound”. 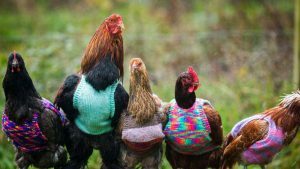 I have to say that my favorite online resource is definitely www.backyardchickens.com. I would recommend it to anyone who has chickens and anyone thinking about raising them. They have articles, advice, blogs… It is my go-to for every chicken question. Just like raising children, you will discover that people are very passionate when it comes to how they believe chickens should be raised. I can guarantee a laugh or two when it comes to reading some of those opinions along the way! If you are thinking about raising chicks, do a little research and give a try. Just don’t be surprised when you find that next year you want to add to your flock! As the weather improves you will find mine following me to the coop at the end of the day. Nope. I’m not a chicken whisperer. They just know that when the bell rings I’m on my way to the coop with a scoop of scratch and no-one wants to miss out.